Training in the winter. Why not? It has been cold these past few days. We have had plenty of snow, the coldest night of the winter and plenty of ice on the ground. But that doesn’t stop us from training outdoors. It just means we take sensible precautions and adapt. Training in sub-zero temperatures and surrounded in ice, like we were last night, can be dangerous. Don’t be an arse and dismiss these real dangers to your life. But be sensible, take sensible precautions and there is no reason we can’t continue getting fit and strong and continue being awesome. In the cold, wear lots of layers. Not only do these keep you warmer than a single thick layer, but I have found they hardly restrict my movement at all. I’ve tried training in a big puffy coat, but my movements have turned to crap. I love my hat and gloves. If my head, ears and fingers are not freezing off, I’m smiling and I can work harder. Be fit and strong to start with. And this last point is especially true for all of us as we grow ever older. Would you rather be the stereotypical OAP shivering in a room with the heating turned right up, covered in cats to keep yourself warm? 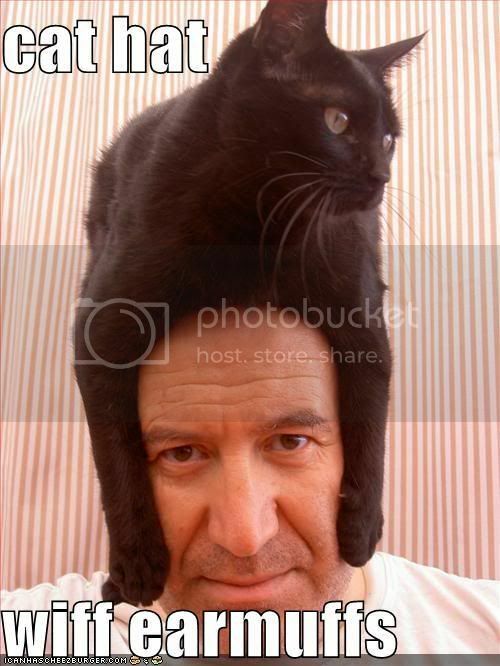 Or would you like to be able to still live a full life, save cash on the heating bills and not be forced to wear a cat as a hat? ← What I mean when I say what I say.